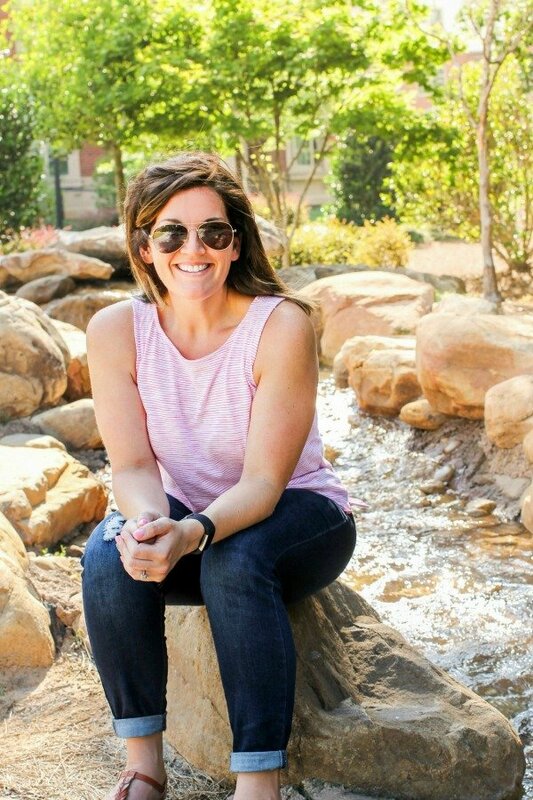 February 27, 2018 By Allyson 26 Comments This post may contain affiliate links. Read my disclosure policy. 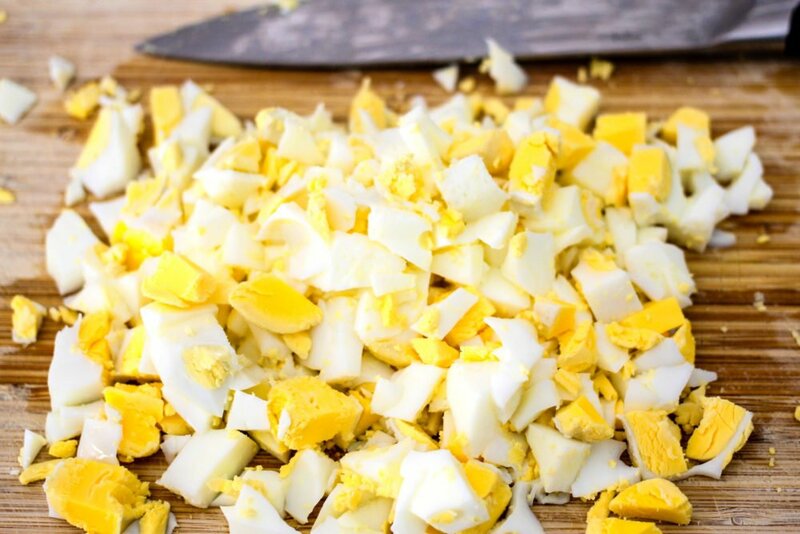 In five minutes you can have a whole bunch of hardboiled eggs which are perfect for egg salad! 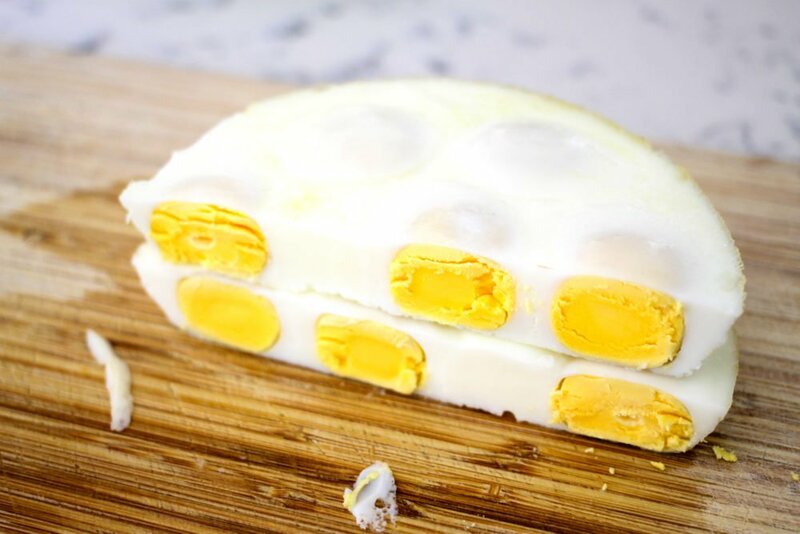 No peeling or ice bath for this Instant Pot Hard Boiled Egg Loaf! Making hard boiled eggs in the Instant Pot is EASY. I use them all the time in my salads, as snacks, or in my kid’s lunches. However, if you are going to need A LOT of hard boiled eggs, you HAVE to try this Instant Pot Hard Boiled Egg Loaf. Making an egg loaf means no peeling the hard boiled eggs, no ice bath for the eggs, and no fuss! Making the instant pot hard boiled egg loaf takes only 5 minutes, and is an awesome instant pot hack! I love using these no peel eggs in my favorite No Mayo Avocado Egg Salad! Don’t want to make an egg loaf? 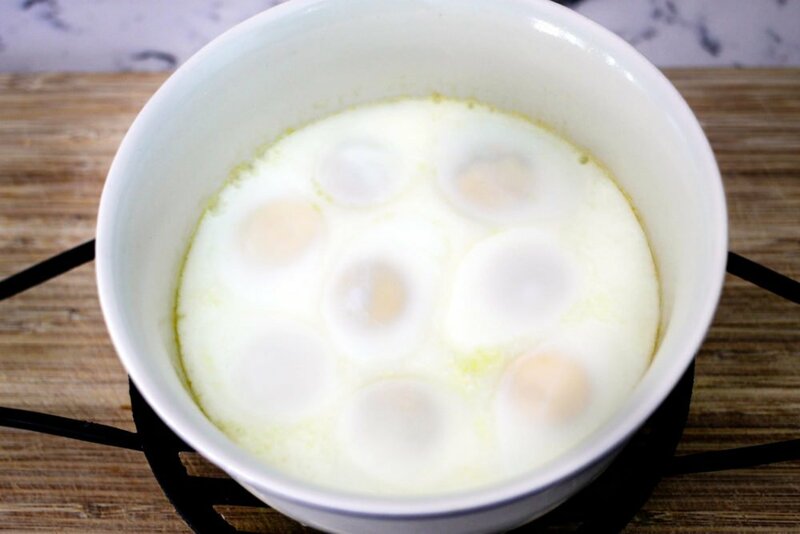 Checkout how to make The Best Instant Pot Hard Boiled Eggs! Using a small bowl or baking dish sprayed with nonstick spray, crack the eggs into the bowl. I used 8 eggs, but you could do more if you need more. Place 1 cup of water into the instant pot. Place steam rack into the bottom of the pot, and place the bowl on top of the steam rack. Close the instant pot and make sure the pressure release is in the sealed position. Cook on manual or high pressure for 5 minutes. When the time is up, allow the instant pot hard boiled egg loaf to natural release the pressure for 5 more minutes, then release the remaining pressure. Carefully remove the bowl from the instant pot (this is why a removable steam rack with handles comes in handy) from the IP, and slide the eggs onto a cutting board. Chop the hard boiled eggs up! Don’t want to CHOP up the eggs? Use a cheese grater to grate the eggs, use a pastry blender to slice the eggs, or use a wire rack and PUSH the eggs through! All awesome HACKS! You should remember when using the Instant Pot, that the time it takes to cook the recipe (5 mins), is not the total time of the recipe. You need to give the pot some time to ‘come to pressure’. Be sure to spray the dish you use to cook the eggs with nonstick spray. If you don’t, it will be a mess to remove them. Spraying the dish slightly allows the eggs to side right out! You need to use an oven safe baking dish inside your instant pot. I like this 24 ounce dish that is 7 inches in diameter. This will fit in the 6qt or 8qt Instant Pot models. Use a removable steam rack inside your Instant Pot. A removable steam rack has handles that allows you to pull the bowl out on the rack, making it super easy to remove. I like this silicone removable steam rack. I have a 6qt. Instant Pot that I make the Instant Pot Hard Boiled Egg loaf in, but you could also use the 8qt. Instant pot. I suggest the 8 quart instant pot if you have a bigger family. NO MAYO Avocado Egg Salad is the healthiest version of Egg Salad! Cut out the fatty mayonnaise by using creamy avocado and Greek yogurt for the best egg salad! The Most Amazing Instant Pot Potato Salad– This is the most amazing Instant Pot potato salad you’ll ever make in just 5 minutes! Loaded with eggs and pickles it’s the perfect side dish to any meal. Perfect Pesto Egg Salad- This crowd pleasing (mayo-free) Perfect Pesto Egg Salad will knock your socks off. 5 simple ingredients and you have yourself and light, flavorful lunch that is great any time of year. Instant Pot Chicken Noodle Soup – Instant Pot Chicken Noodle soup is rich with flavor and takes only a fraction of the time to make. Warm up on a cold day with this major comfort food. Instant Pot Loaded Cauliflower Soup – It is rich, creamy, and delicious and has all of the comforting flavors of a loaded baked potato! Using an oven safe small bowl or baking dish sprayed with nonstick spray, crack the eggs into the bowl. Place 1 cup of water into the instant pot. Place steam rack into the bottom of the instant pot, and place the bowl on top of the steam rack. Close the instant pot and make sure the pressure release is in the sealed position. Cook on manual or high pressure for 5 minutes. When the time is up, allow the instant pot hard boiled egg loaf to natural release the pressure for 5 more minutes, then flip the switch to release the remaining pressure. Carefully remove the bowl from the instant pot (this is why a removable steam rack with handles comes in handy), and slide the eggs onto a cutting board. 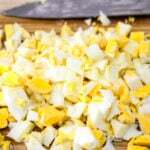 Chop up the hard boiled eggs. Use as needed. I used 8 eggs in my bowl, but you can easily use up to 12 eggs. This is so cool! Can’t wait to try! This is amazing! I will have to give this a try very soon. So convenient – great idea! My boys ask for avocado egg salad on the daily so this is going to make my life so much easier! Thanks!! This is such a genius way to make them! Love it!! My first try failed. I used a spring form pan with aluminum foil in it. Not a good idea. Now I’m trying with a small Corning Ware dish.. will post back if it works. Yes! I don’t recommend using the foil! I am glad that the corning ware dish worked for you! Every thing I read says don’t use glass in instant pot, there not made for pressure cooking. So confusing to know what to use. I’ve done lots of research and most things say that if it’s oven safe, it’s safe to use in the IP, but definitely use caution if you want to side on the side of caution. I haven’t had any issues in all of my recipe testing etc, but again, be careful! You could use a silicone bowl like this or this. This is my favorite hack for egg salad too! So fast and easy! This is a great idea, and I use it often. However, I leave my eggs in a bowl (rounded bottom works best) and chop them with my pastry blender. It works great if you like the eggs finely chopped for egg salad (which I do), and all the egg stays in the bowl. Makes cleanup very easy. Weird question, but, what if I wanted to do them as individual eggs? In smaller ramekins. Or if I just wanted say 2 or 3 Eggs. I know that most times the amount does not change the time for cook8ng. And now I want to try it, but less time for soft boiled…. hmmm… ever try it? I’ve tried it in smaller quantities and used the same amount of time. I haven’t tried soft boiled, but I would decrease the cooking time by 1-2 mins – you may have to play with it! I tried it for 4 minutes and it wasn’t enough time so put them in for another 2 minutes and they were done. This is so east. I will use this method again. What a great idea. Thank you. That’s great! The directions do say to cook for 5 minutes, and then let sit for 5 minutes WITHOUT releasing the pressure. Not sure if you let them sit, and cooking for 4 mins I guess is why they weren’t done. The good news is, you were still able to add time and use them! I love this method too! Wondering if you can do this and potatoes at same time for potato salad?? I have no idea what I did wrong! 12 eggs in a round, flat bottomed bowl, 5 minutes with 5 minute release and it was nearly raw, put them back for an additional 5 mins with 5 mins release, looked solid, flipped over and it gushed from the middle, most of it was completely uncooked. YIKES! Will try again with less eggs maybe? Bri- I have no idea what happened! I have made this at least 20 times and it comes out perfectly every time. Did the Instant pot actually come to pressure, count down the 5 mins, and then you left it for 5 mins on natural release? My neighbor didn’t realize you have to let the IP ‘come to pressure’ before it started counting down, so sometimes I want to make sure other people aren’t doing that. Did you ever try it again? I have a question: I don’t have and don’t want an Instant Pot, but I do have chickens and use a LOT of eggs. Can I do this in a double boiler for a longer time?